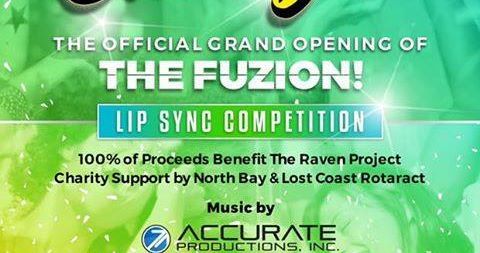 Lost Coast Rotaract, North Bay Rotaract and The Fuzion present The Fuzion’s Grand Opening, a fundraiser to benefit The Raven Project. Come out during Eureka Arts Alive on Saturday, May 6th to support The Raven Project. 233 F Street in Eureka. Doors open at 6pm, event begins at 7pm. There will be a Lip Sync Competition held with celebrity judges: Miss Inked Hearts 2016, Eureka City Council Member Austin Allison and News Channel 3’s Monica Petruzzelli. Miss Fuscia Rae will be MCing the event! Live painting and art display by Dakota Daetwiler. Beer and wine for ages 21 and up! Cash prizes for winners of the Lip Sync. Raffle giveaways! Selfie mirror! Once registered, you may visit www.accurateproductions.com to choose your song. Click on “guest requests” in the upper right corner. Choose May 6th 2017. Password is “Rotaract.” You may choose from the song bank. If the song is not available, you may contact Accurate Productions and they will find your song.